The Conceiving Histories Exhibition at the Peltz Gallery, Birkbeck, University of London is the culmination of an innovative collaboration between my fellow medievalist, Isabel Davis, and the visual artist, Anna Burel, which focuses on what they call ‘un-pregnancy’ or ‘pregnancy feigned, imagined, hidden and difficult to diagnose’. 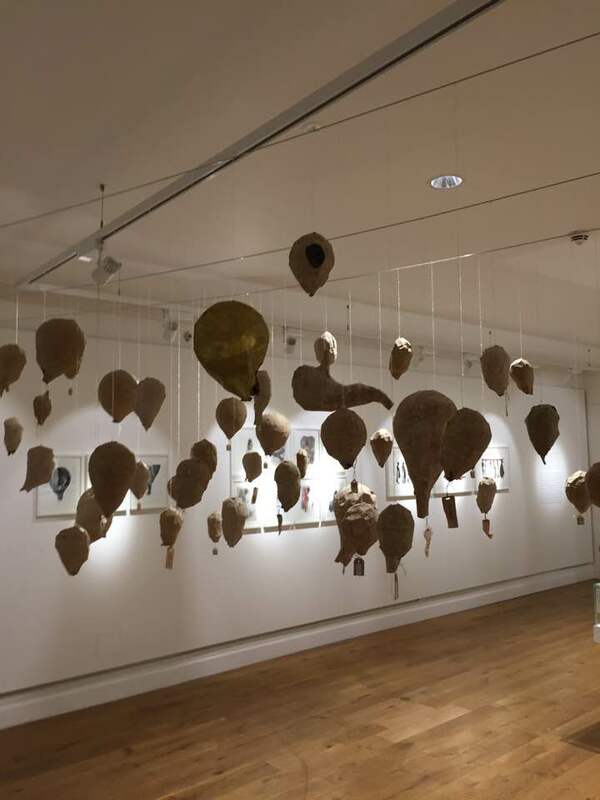 Walking in to the Peltz Gallery, the visitor’s attention is drawn to Burel’s artwork, and in particular to the empty uteruses, of many different sizes and shapes, suspended from the ceiling, each individually tagged with hand-written labels like so many gynaecological specimens or the detritus of multiple hysterectomies. The effect is unsettling, and deliberately so: is this abstract art or an anatomy museum? The exhibition, in which the artwork–photographs, drawings, costumes, sculptures–is accompanied by historical case studies, asks the question, ‘is unpregancy a state of mind or is it somatic?’. It refuses to provide a simple answer. Conceiving Histories is an exhibition that will, I am sure, speak to women and men who have themselves struggled to conceive. It also has a much wider appeal to anyone invested in recovering or reimagining the lost histories of women. The project takes as its starting point an absence. It asks ‘How can something that doesn’t happen have a history?’, a question that resonates with my own research, which explores the apparent non-existence of early women’s writing. Davis and Burel have undertaken careful research, tracing a narrative that takes us from Queen Mary I (Sellars’ and Yeatman’s ‘broody Mary’) in the sixteenth-century through the strange fashion for padded stomachs in late eighteenth-century London to the nineteenth-century experimental conception hospital and ending with the Family Planning Association’s Frog Test of the 1960s. But their creative response takes us out of the archives, and into the minds and bodies of the women who waited for pregnancies that would never result in birth. This is imaginative scholarship at its best, elegant, meditative, and compassionate.